BitcoinBing is a uniquely-constructed decentralized cryptocurrency exchange that provides features to its users that no other cryptocurrency marketplace has ever provided. Its key features, like Customizable interface, Peer-to-Peer trading concept and Powerful trading engine which can handle up to 1,000,000 order per second, makes it totally different from its competitors around the trading ecosystem. 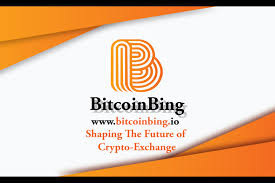 The platform allows its ICO investors to trade on the engine without paying any transaction fees which means that if you are an investor of BitcoinBing’s ICO, you are free from transaction fees on the platform, and also, you would receive additional bonuses over time if you are one of the holders of Bing token. The platform is for users coming from any race or any part of the world no matter where they are from or what their language is. BitcoinBing is a multilingual platform which means that unlike other exchange platforms, it is not limited to only one or a few countries, but it will be available for users from any corner of the world.